"Horseboy" is a man with a horse head who has shown up in various places across the Internet, including places like standing on the side of the road in Scotland in Google Streetview. Every so often, Brian will play an animated GIF of a man in a sportcoat and a horse mask dancing. Tech News Today episode 19 was titled "When Horseboy Attacks". In Debit Daddy, Patrick Delahanty included Horseboy in an Adobeshop prediction for what Brian and Justin would encounter at Dragon*Con. 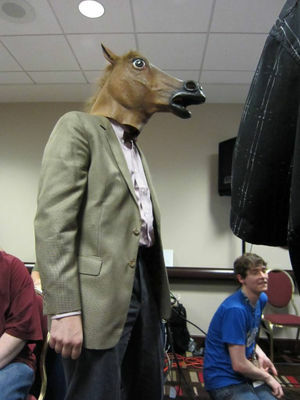 During the live show at Dragon*Con, Patrick put on a horse mask and was picked by Jack Powell to be his Geek Fighter. Horseboy performed the dance to defeat Debit Daddy and an alien in battle. Of Horseboy, Brian said, "Look at my horse. My horse is amazing." Adding, "It may in fact be a moth." Horseboy and the alien shared a tender moment and made out in front of the audience, which disgusted Veronica Belmont and sent Brian and Justin into fits of uncontrollable laughter. Following the live show, Justin put the mask on and danced. After Dragon*Con, Tony edited clips from that episode into Scott Johnson vs. The World when Brian and Justin recapped what had happened. Horseboy later appeared in part of the after show for You've Been Rookered complete with headset and microphone. In Eight Equals Equals Equals Dee, Horseboy was declared to be the deity for Bonearth. In Betterlection Day, Horseboy was elected President of Bonearth and the Betternet as a third-party candidate and part of a joint ticket with Fapper. One of the ads in the episode featured Horseboy in front of an American flag citing his experience defeating aliens, a reference to Dragon*Con: Con of a Dragon. Another political ad featured part of the "Justin Danes as horseboy" video and claimed that Justin himself was Horseboy. Although Justin has impersonated Horseboy and attempted to copy the dance, Justin is not Horseboy. This ad was created by Kuhan, explaining the lack of knowledge and intelligence. All voices in this ad are the voice of Patrick Delahanty and each of them has been modified with a different Garageband effect (including "Male to Female voice" for the first voice). The music during the shot of Horseboy is the "Look at My Horse" song. The Horseboy mask was then worn by Brian during Slower and Creepier in which footage was shot for a commercial to promote NSFW. Horseboy will return to Dragon*Con and distribute Skittles before the live NSFW. Horse Boy Tribute in Portland? This page was last modified on 18 February 2014, at 17:57.